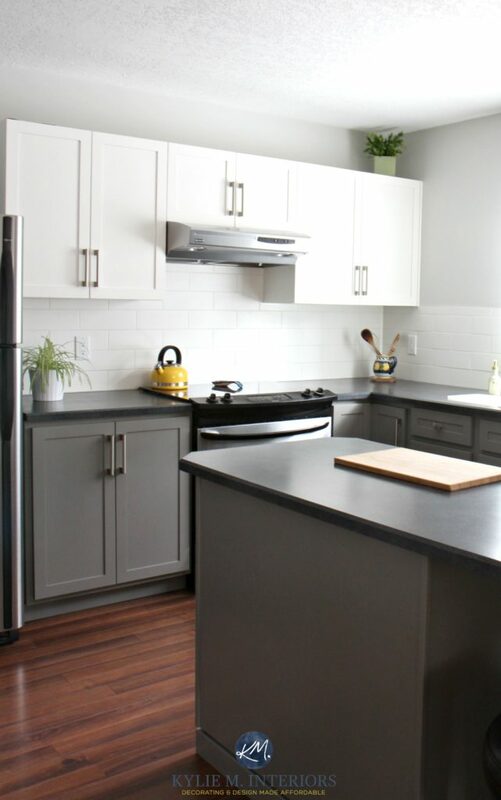 A Budget Friendly Kitchen Update – White, Gray and Gorgeous! You are here: Home / My Projects / Kitchen Remodel and Design / A Budget Friendly Kitchen Update – White, Gray and Gorgeous! If you’ve been on Pinterest looking for ways to update your kitchen, you’ve likely noticed a lot of white, gray and open shelving. However, like most things, it’s ALL in how you do it (that’s what she said) and this was definitely NOT doing it for my clients. They were looking for a cleaner, more updated look for their kitchen. A look that was modern, good for resale AND budget friendly. You ready for the big reveal???? I have MAD love for this space now. SAME lower cabinets, SAME countertop, SAME appliances and with a lil’ blood, sweat and beers it’s a fresh, bright and super functional space. And not only that – it was super budget-friendly! 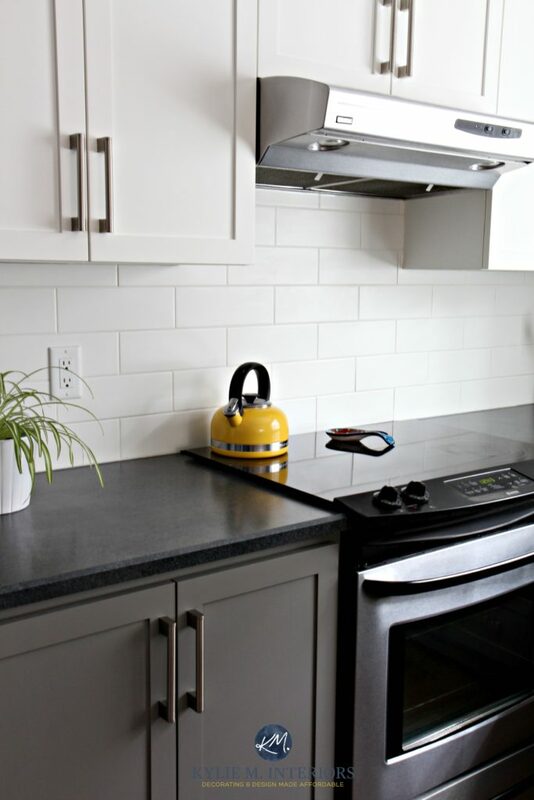 The kitchen looked drab and lifeless without any products to reflect light and add energy to the room (and check out the underwhelming backsplash…). The base cabinets were painted Benjamin Moore Chelsea Gray and outfitted with new polished nickel hardware. It was the perfect combo to complement the new white, shaker style upper cabinets. 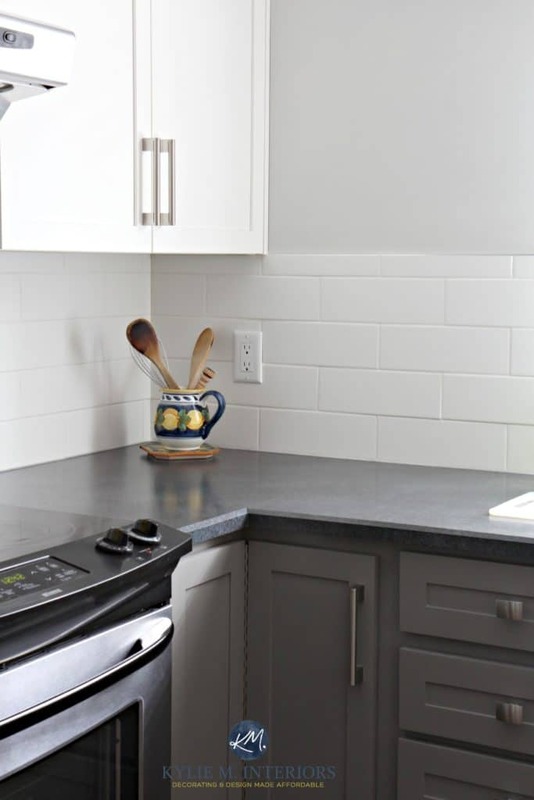 We chose Benjamin Moore Gray Owl for the walls, offering a fresh clean look to complement the countertop and cabinet colours. So if they can do it, YOU can too! Check out my affordable Online Colour Consulting and Decorating Packages! Love the remodeled look! Although they are fashionable, I’m not a fan of open shelving. To me, their kitchen looks horribly cluttered with the open shelving. It’s almost as if the shelving didn’t contain/conceal their things so the things oozed down to the countertops – in fact there isn’t much stuff on the shelves but a lot on the countertops. Oooohhhhh I love the close shelving! It looks amazing. Thank you thank you thank you for not just following the trend. I could never do any heavyweight cooking with open shelving and always sad everytime I saw someone on blogland just change the top cabinets for open shelving for making the kitchen ‘airier’. I can totally see that the new one is way more functional and will definitely add more values to the house if they sell it later. It certainly is quite an improvement. Much more appealing to look at vs. their original attempted design. I am interested to know what the color choice on the upper cabinets is ? Also do you have any info or have you done a color review on Benjamin Moore PM-21 Sail Cloth ? I’m looking to paint kitchen walls and saw a “little” paint chip for this color, but not sure what the color tone etc. in it. I am looking to paint out my 1960’s rancher kitchen cabinets, and am liking the Sail Cloth for a wall color. The closest BM retailer is now 55+ miles from where I live, (there was one local in my city 3 yrs ago, but the store no longer supplies BM) so I’m needing more research before I take the plunge. Sherwin Williams is close at hand, but there again I don’t know their color formulations compare with BM. I really enjoy your down-to-earth reviews about color and how they “act”. You are a gem ~! What a transformation! Beautiful! I love that it relied on many of the pre-existing elements. Those colours work perfectly there. Kudos to you,Kylie, and to the homeowners. Well done. What a fabulous update. The kitchen looks so much better and brighter. It is so much brighter that I really have to ask–was additional lighting also part of the renovation? It’s really amazing. I have a couple of other questions–what size is the subway tile? Why go with white grout instead of grey? (I’ve heard white is harder to keep clean). Lastly, why not take the uppers to the height of the ceiling since they were being put in. Oh, were the uppers painted in a Benjamin Moore colour as well? Thanks. I am one of the homeowners – thanks for your interest! No, there was no additional lighting, although the “Before” pictures were taken with my iPhone, and Kylie used a better camera for the “After”. The subway tile is 4 x 12 inches. We picked this size because the space between the bottom of the window and the top of the counter is 4 inches, so we didn’t have to do any tricky cuts there. We also liked the more modern appearance of the larger tile. We chose white grout because I prefer the look, I find it is less “busy”. than a contrasting dark grout. We (I say “we” but really my husband did it) used a sealer on the grout to help keep it clean. He applied it with a very small brush. I wanted to take the uppers to the ceiling but it wasn’t in the budget, unfortunately. The cabinets are not painted, they are a standard white from Kitchen Craft. what is the upper cabinets colour? Hi Lynelle, that was just the ‘in-stock white’ colour that came with the cabinets. It IS a pretty darned clean white, likely close to SW High Reflective White as there was NO warmth in it at all! Very beautiful! What a nice updated kitchen looks so much larger and less cluttered. (Not a fan of the open shelves) were updated and modern! Love that it was also budget friendly! Amazing update! I love white kitchens so much!